When it comes to getting the most (money) from your annual tax return, there is usually a lot to think about, so we’ve identified a few options that could open the door to some opportunities to save on tax. The key here is to plan ahead. 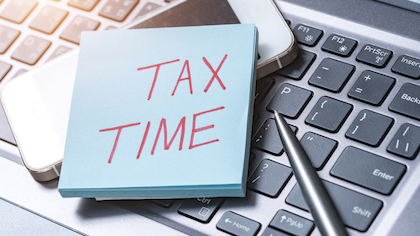 If you have some spare cash available, paying for certain expenses before June 30 could mean you get your tax break back from the ATO earlier. Expenses paid in July could leave you waiting more than 12 months for the return. A popular expense in this category is prepaying interest on an investment loan, but be careful because not all expenses qualify for a tax deduction in advance. This year the ATO is focusing on work-related expenses. If you are planning to claim expenses for things like a home office, mobile phone, tools and equipment, etc, make sure you claim only eligible expenses and have the paperwork to substantiate them. You can claim the premiums you have paid for your income protection insurance as a tax deduction. Note that you can only claim the portion of the premium that covers you for loss of income, not for any benefits of a capital nature. Premiums for other personal insurance cover such as life, critical care or trauma cannot be claimed. You also can’t claim deductions for premiums that are paid from your superannuation contributions if your policy is held in your fund. June 30 is not just about deductions for expenses. It's also a good time to review your superannuation contributions to date and take advantage of the annual caps. The annual limit for these types of tax-deductible contributions is $25,000 per annum, regardless of age. If you're an employee, this limit covers both employer super guarantee and salary sacrifice contributions. How much has your fund received in contributions so far this year? Do you need to review and adjust your current arrangements? Anyone under 65 (whether working or retired) can contribute $100,000 each year to super as after-tax or non-concessional contributions. You can also contribute $300,000 in a single year by bringing forward the limit for the following two years. But – when it comes to super there’s usually a ‘but’ – check your total super balance to ensure any extra contributions do not exceed the general balance transfer cap of $1.6 million for 2017/18. And one final point on super contributions – the total contributed is based on how much is received by your fund, not when you sent it to the fund. Another reason why planning ahead is crucial. These are just a few ways to manage how your money is taxed. Depending on your circumstances, other options may be available. Please contact us on 1300 895 311 we can work with you to help you achieve what is best for you this financial year. But please don’t leave it too late. This provides general information and hasn’t taken your circumstances into account. It’s important to consider your particular circumstances before deciding what’s right for you. Any information provided by the author detailed above is separate and external to our business and our Licensee. Neither our business, nor our Licensee takes any responsibility for their action or any service they provide.